James Beales was the bill-poster and town crier for Beccles from the 1850s through to his death in 1909. Before the days of affordable newspapers and improved education laws, men like James Beales would have held a position of great importance and nobility (His father, James Beales senior, was also a town bill-poster in Beccles). 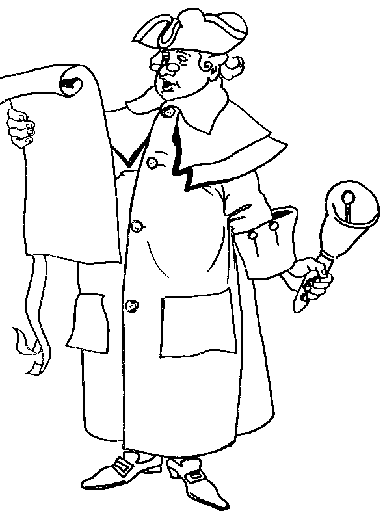 Historically, a town crier was an officer of the Court and his job was to make public pronouncements in the streets. The stereotypical image of a town crier would be of a portly gent in a red robe or coat and tricorne hat, waving a handbell in one hand and carrying a proclamation in his other hand. He would shout, "Hear Ye! Hear Ye! Oyez! Oyez!" in a clear, booming voice so as to be heard over the din of horses hooves and traffic wheeling by as well as general street and pedestrian activity. Proclamations, local bylaws, market days, and advertisements were all proclaimed by a crier or bellman. James Beales was baptised in 1833 in Halesworth, county Suffolk but almost all of his life was spent in Beccles. He was the son of James Beales and although his baptism record says his mother's name was Patience, his mother was Elizabeth on the census returns of 1841 and 1851 (It is possible that Elizabeth could have been his step-mother). The 1841 census return shows the Beales family living at Wash Lane in Ingate Street where James Beales (senior) was working as a Tin Plate Maker. James junior was aged 9, and he had two sisters, Caroline and Ann, and two brothers, William and Charles. In 1851 the family had moved to a premises in Hungate Street. On 17 January 1855 James junior married Maria Dean at St Augustine's Church in Norwich. They had one known son, James Joseph Beales, born later that same year, in Beccles. ADVERTISEMENT: James Beales*, Messenger, Bill-Poster & Distributor, Hungate Street. *This would have been James Beales senior as James junior was living in Blyburgate Street with his wife Maria and their son James Joseph. James Beales junior was a Messenger & Auctioneer's Assistant. On 12 March 1859, James Beales (senior) died, aged 64 years. 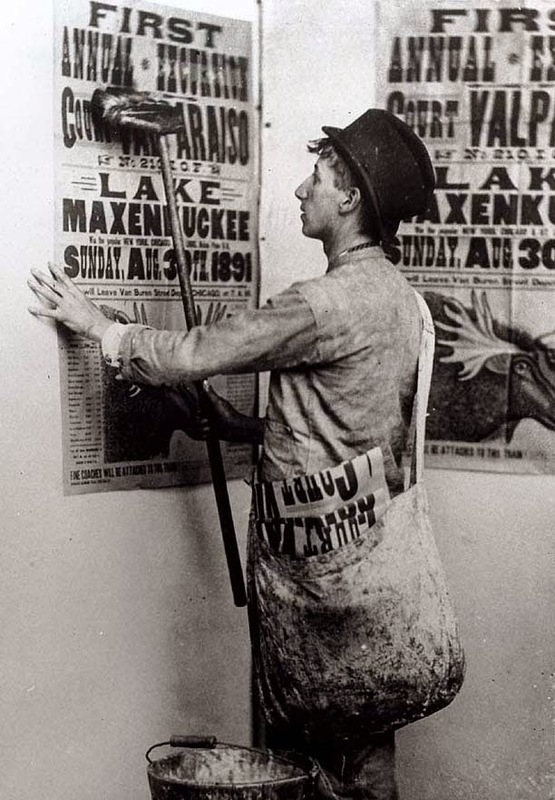 The newspaper reported that he was for many years bill-poster in Beccles. In September 1865 the Beccles newspaper advertised James Beales (junior), Bill Poster & Auctioneer's Assistant as having moved to Hungate. Tragically, three years later, James Joseph Beales died aged 13. In September 1872 James Beales was ordered by the Council to "remove encroachments" created by his new shop in Hungate. In January 1875 the East Suffolk Gazette reported that James Beales (bill-poster) had been appointed the new Beccles bellman after James Potter resigned. ADVERTISEMENT: Hungate Street, Beccles, James Beales, Bill Poster, Auctioneer's Assistant & Town Crier. Umbrellas and Parasols manufactured & neatly repaired. All frames recovered. Sometime before 1881, James and his wife Maria moved to Smallgate Street and it was here they remained until their deaths. Their former premises in Hungate Street was sold in late 1878 and eventually pulled down that same year. The Kelly's Directory of 1883 records James Beales under the heading of PUBLIC OFFICERS: Town Crier, Smallgate Street. Under the COMMERCIAL section: James Beales, Bill Poster & Town Crier, Smallgate Street. Something went wrong for James Beales from the turn of the new century. The first decade of the 1900s saw James appear in the newspapers several times. The Beccles Almanack of November 1902 reported that he met with a serious accident when descending the hill from White Horse Yard to Puddingmoor, fracturing his left arm. The report doesn't state the nature of his accident, whether he was riding a bicycle, a small cart or on foot. Beales, the borough bellman of Beccles, an old man, was sentenced yesterday to fourteen days' imprisonment for using obscene language. On removal to the cell he attempted suicide by cutting his throat with a razor, which he had concealed in his pocket. His recovery is probable. Sadly, it doesn't end there. On 27 September 1904 the East Suffolk Gazette reported that James Beales, Bill Poster & Town Crier, was drunk at the One Bell public-house in Smallgate Street "where defendent was excitable, his language was unbearable in the street and many parts of the town....the time has come when he should not be allowed to insult women and children". Beales was sentenced to another fourteen days imprisonment in Norwich Gaol when he reportedly claimed in court, "Well I have been there before and now have to go again." The East Suffolk Gazette of February 1908 reported that Fred Hall of Northgate Street was the new Town Crier of Beccles. Maria Beales died later that same year, aged 71. James Beales died in 1909, aged 77.